Somehow Israeli designer Galit Dayan Raviv was able to take his approx. 140 mr. city apartment and turn it into a surprisingly functional home that provides minimal but cosy home for family of 5 per. Besides being functional, the minimal space is pretty aesthetically amazing. 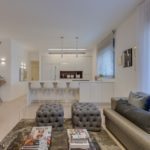 This entry was posted in apartments, bathroom, bedroom, kitchen, living and tagged apartment, bathroom, bedroom, Galit Dayan Raviv, house idea, houseidea, kitchen, living, myhouseidea on November 27, 2016 by admin.